When The Pilot and I left for Australia, we didn't have an agenda. We got on a flight to Sydney and decided to just wing it. We knew we wanted to see other parts of the country, but which parts? We didn't know. We settled on Cairns after talking to a lot of different people for one primary reason. The Great Barrier Reef, one of the seven natural wonders of the world, may not survive our lifetime. In fact, just three weeks after we snorkeled the reef, it was declared dead (a rumor that was later debunked, but highlights a sad reality). We took a mid-morning flight from Sydney on a Tuesday and booked two nights in an Air B&B. We knew we wanted to go snorkeling and booked a tour with a snorkeling company that had pretty good reviews on Trip Advisor and was priced better than some of the others. The flight from Sydney to Cairns was about 3 1/2 hours long. 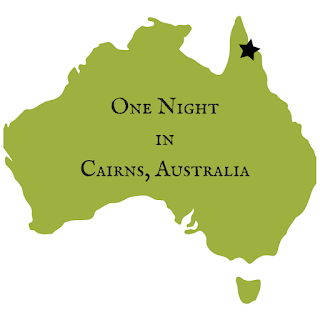 When we landed, we took a shuttle bus to downtown Cairns to the Air B&B we booked which, was not, as described, a room in someone's apartment where we stayed in Sydney, but a hostel with rooms with 8 beds and 20-year-old college students. It was awful. We checked in and were immediately disappointed. We hooked up to the wifi and tried to find another hotel nearby but everything was outrageously expensive. We decided to try to make the most of our trip and venture out into Cairns but it felt like an old, run down college town, and I wasn't a fan. If there had been a flight out that night, I would have taken it. As we were wandering around trying to find something to eat, we got an email that our snorkel tour had to be canceled and that we had been automatically rebooked on another tour. I took this as a sign that we should leave. We went to the tour company and tried to get a refund, and of course, that wasn't an option. We didn't sleep at all that night in Cairns. Our hostel was reminiscent of every other hostel I stayed out when I was 20. Drunk college kids screaming in their shared dorms until 4 in the morning...and we had to be up to catch a boat at 6am! I don't have many pictures from our snorkel tour because they were charging $35 per photograph on the boat and we didn't bring an underwater camera. Our snorkel tour was ok. We had booked a different one and there were a lot of options on this tour that were only available to people who had originally signed up for that boat, which was frustrating. The weather was perfect. Whereas Sydney was just hitting spring, Cairns was at the tail end of summer and I loved lying on the boat in 85-degree weather, soaking up the sun. We went to two different snorkel sites on the reef. The reef itself was gorgeous but there really weren't that many fish around, which was disappointing. Our tour wrapped up about an hour early and The Pilot and I ran as quickly as we could back to our hostel, got changed, packed, and headed straight to the airport. We only had about 45 minutes to spare and were really lucky to get on a flight out that night because neither of us wanted to spend another night in Cairns. So, this was the sore spot of our trip. I hate to sound like the person that wasn't impressed by the Great Barrier Reef, but the truth is, there was better snorkeling in Hanauma Bay, Hawaii. The Reef is huge and I definitely think there are better spots to go. I wouldn't recommend visiting Cairns. It's a tiny town without a lot of options in terms of hotels, food, or shopping, but there are plenty of other little resort towns on the Reef that I've heard offer incredible snorkeling and diving and are a much better launch point for seeing the Reef! Those places are further from the Cairns airport than we were willing to travel for what was supposed to be a two-night stay, but that would be my recommendation! It's a shame that our accommodations were so terrible too because that really put a damper on things! When you factor that in, plus our original snorkel tripcanceledncelled, I think we were just unlucky. We left Cairns's 85-degree heat and landed in Melbourne just before midnight, in the middle of a storm of freezing rain. I immediately regretted our decision to head south, but once we started exploring Melbourne the next day, I fell in love! While I wouldn't call this a vacation "horror story," we didn't have the best time. Do you have similar experience from a vacation you've taken?